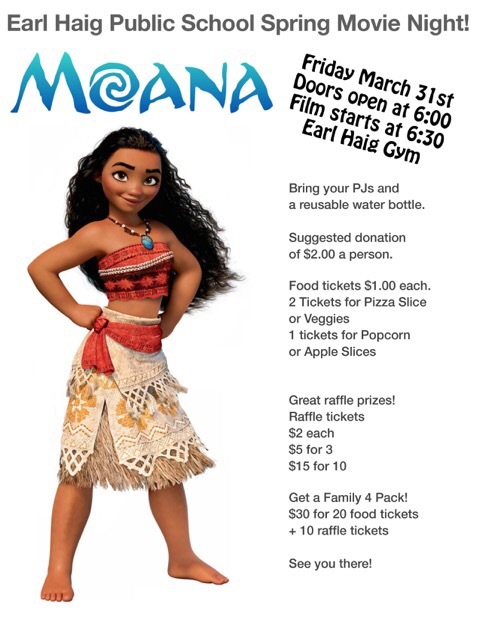 Volunteers needed for Moana Movie Night This Friday! Countdown to the big movie night is on at our house – and if your little ones haven’t heard about it yet, we’re sure they will soon with morning announcements being planned at school through the week (though it’s doubtful they will need reminding about this right mom & dad?)! Can you help? Pulling together this fun event takes a lot of helping hands – and if you’re going to be there anyway why not join us? We’re trying something new with an online form and lots of shorter shifts – so we promise you won’t be on pizza duty the whole night. Find a job and shift that works for you and signup here! You could even buddy up with a friend and tag team minding the kids for the night to give you both a chance to help.